﻿ Stillwater Meeting House - Ohio. Find It Here. The plain federal style brick building seats 1,500. Built in 1878 to house the Ohio Yearly Meeting of Conservative Friends. The Stillwater Meeting was established as a result of the great tide of Quaker migration which swept up from the Southern states after 1800 as Quakers sought to raise their children in new lands free from the evils of slavery. In 1808 Stillwater was elevated to the status of monthly meeting which gave it more control of its own affairs and included responsibility for other preparative meetings which now began to develop around Barnesville. This was the year that Barnesville, until then a wilderness, was laid out and its lots offered for sale by James Barnes, a Quaker.The members of Ohio Yearly Meeting built the structure in 90 days for $9,000. The first meeting in the new building was attended by a grand gathering of 1,500 people. 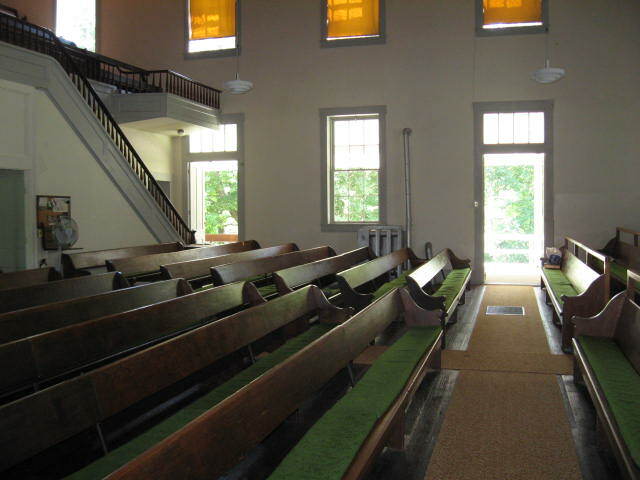 Like most old meeting houses, it is divided into two identical parts, one side for the women, and one side for the men. The building, on the National Register of Historic Places, contains a Quaker Heritage Museum. Open by appointment.